I have used the same brand of makeup remover since I started wearing makeup in high school. I think I’m on my third tub of Jergen’s Face Cream. It lasts forever and costs less than $5. They literally cannot be making any money. Anyway, for some reason, they messed with the perfect product and changed the formula somehow. Suddenly, this latest tub has made my eyes burn every day when I use it. So when I saw this pin for DIY makeup remover, I was intrigued. Since I’ve used up all my party ideas and pins, I had to find something new to do for today’s post, and this was it. 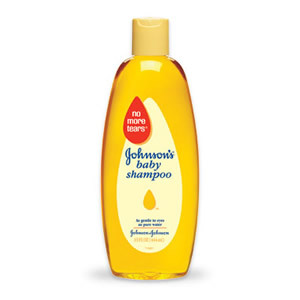 I went digging through the house and managed to find an old bottle of Johnson and Johnson’s baby shampoo. I’m pretty sure it was Bryce’s, so I’m not certain it has the same level of potency that a new bottle would have, but it still had that yummy baby smell. I couldn’t find any baby oil, so I used olive oil instead. It only took about 5 minutes to put it all together, and when I tried it out, it did take off my mascara quickly and cleanly. And best of all, it didn’t burn my eyes (I can thank the “No more tears” formula for that). Because I had the supplies this was a freebie! Even if you bought baby shampoo and baby oil, you would still only spend about $3 for this makeup remover. That’s a huge savings over store brands! A funnel helps for transfer, but I don’t have one, so I used a paper cup and squeezed it to form a pour spout. I imagine this batch will last me a few months at least. Yay! Another successful project!